Looking for a father's day gift idea for a new dad? 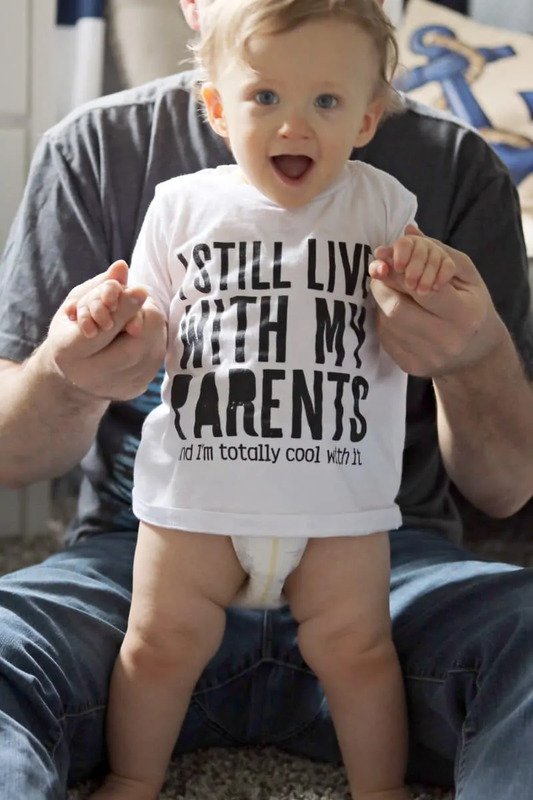 Check out these ideas of ways to wish dad a happy first father's day from baby. I want to do something extra special for my husband to celebrate his first Father's Day. He is an amazing father and I want him to know how much myself and the little guy appreciate him. My son loves his Daddy so much. In fact, he prefers daddy over Mama lately! When daddy comes home from work Nathaniel's eyes light up and he reaches out for Daddy to pick him up. He loves rolling around with daddy on the floor and snuggling with daddy on the couch. 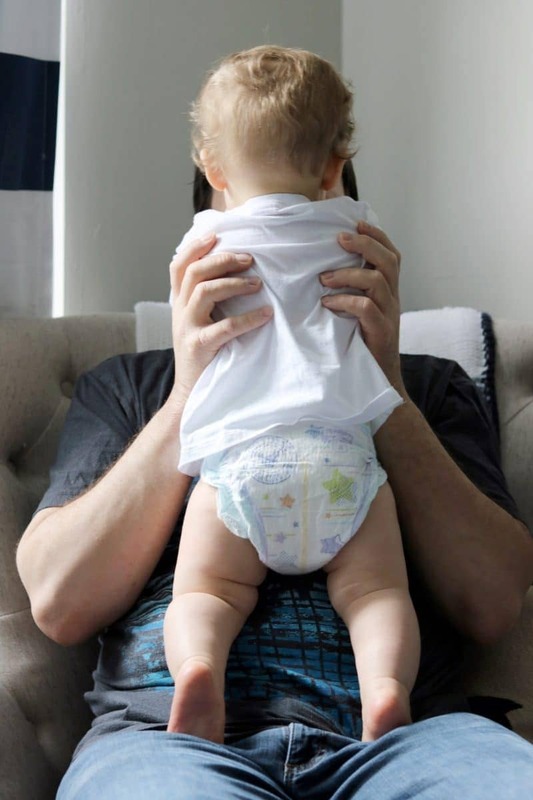 Luckily, I do not have to worry about diaper leaks thanks to Huggies Little Movers Diapers. Huggies Little Movers are the perfect diaper for our active little guy. They fit him well and stay in place even as he rolls, crawls, around and plays. 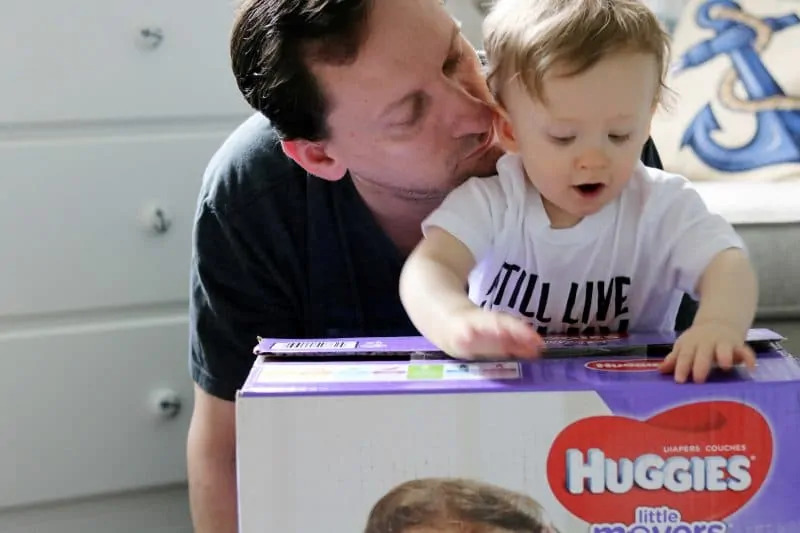 Celebrate Father’s Day with up to $3 off on Huggies, Pull-Ups, and GoodNites + 20% off and free delivery through Amazon Family Subscribe & Save. I love the savings and convenience of ordering my little guy's Huggies Little Movers diapers through Amazon's Subscribe & Save program. 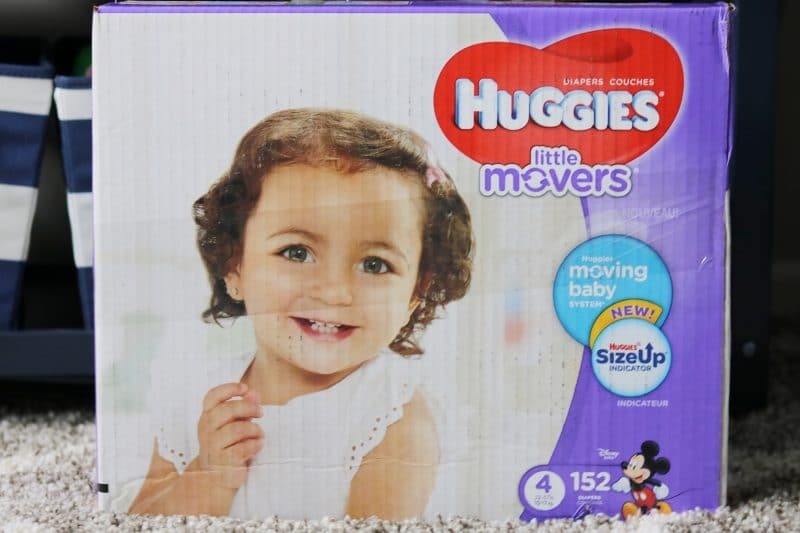 We have it set up to deliver a shipment of Huggies Little Movers every month, and this way we never run out of diapers. As a busy mama, I am always grateful for less thing to worry about! With Subscribe & Save you can set up automatic deliveries of all the items that your baby — and family — needs. I have found that products such as diapers, wipes, baby food, laundry detergent, paper towels, toilet paper, and trash bags are perfect for Amazon's Subscribe & Save program. You can set your own schedule and quantity of items that you would like delivered. If you ever need to skip or cancel a shipment doing so is very simple as well. 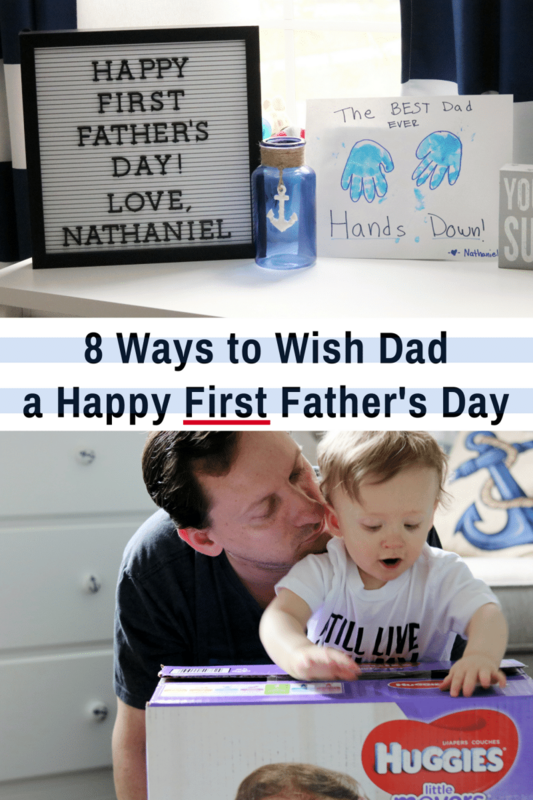 Since I wanted to make my husband's first Father's Day extra special, I came up with a list of 8 ways that I can wish him a happy first Father's Day from the little guy and myself. I think that these ideas would be perfect for any family, not just my own, so I wanted to shave them with you all as well. 1. Let Dad sleep in – The gift of sleep. What parent doesn't need to catch up on some sleep? Start Father's Day off right by letting Dad sleep as late as he wants. 2. Serve Dad breakfast in bed – Then, serve dad a hearty breakfast in bed. Bring on the bacon! 3. Give Dad a break from diaper duty -Take over diaper duty so Daddy doesn't have to change any diapers on his special day. 4. 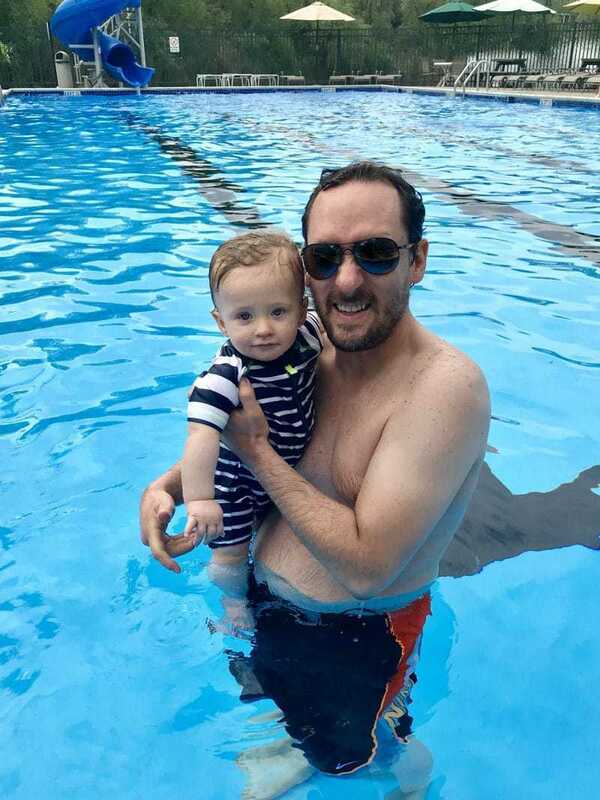 Enjoy a day at the pool – If dad and baby are water-lovers, why not spend the day at the pool? If you have a beach nearby that would work as well. Splish splash! 5. 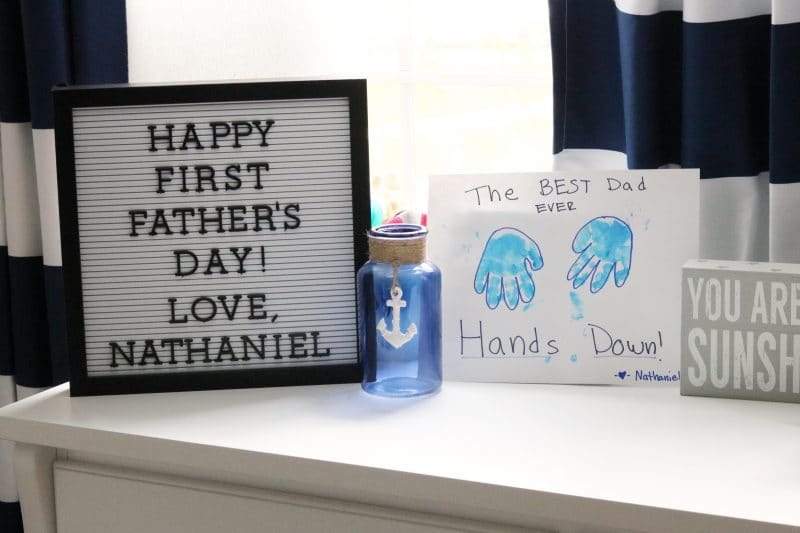 Make Dad a Father's Day card from baby – When it comes to a card from baby, store bought cards just aren't going to cut it for Dad's first Father's Day. 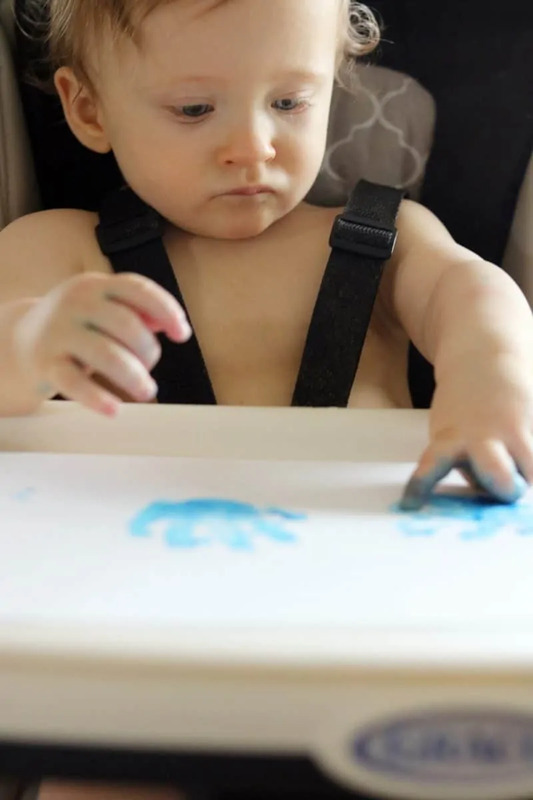 Get creative and make a card that baby can actually have a part of helping with. 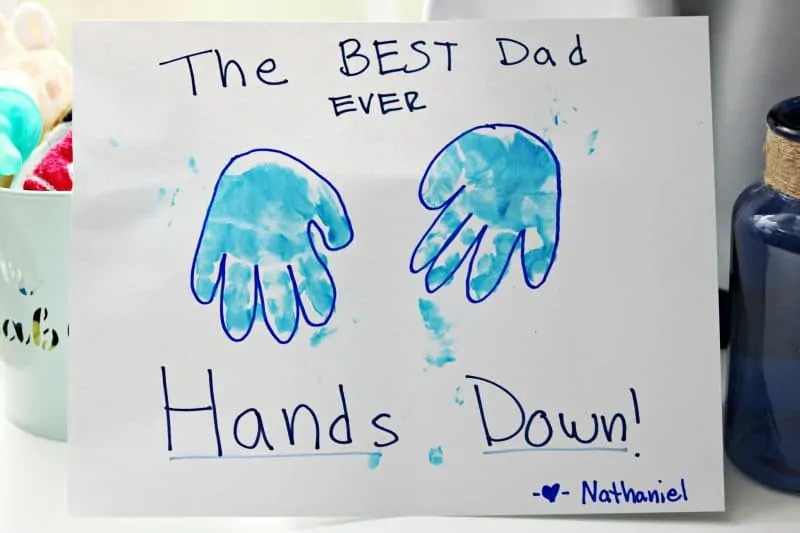 We made this simply handprint card that reads “The Best Dad Ever… Hands Down!” While it did come out a little bit sloppy due to baby enjoying smearing the paint all over the place, it's okay – it shows that baby was having fun! 6. 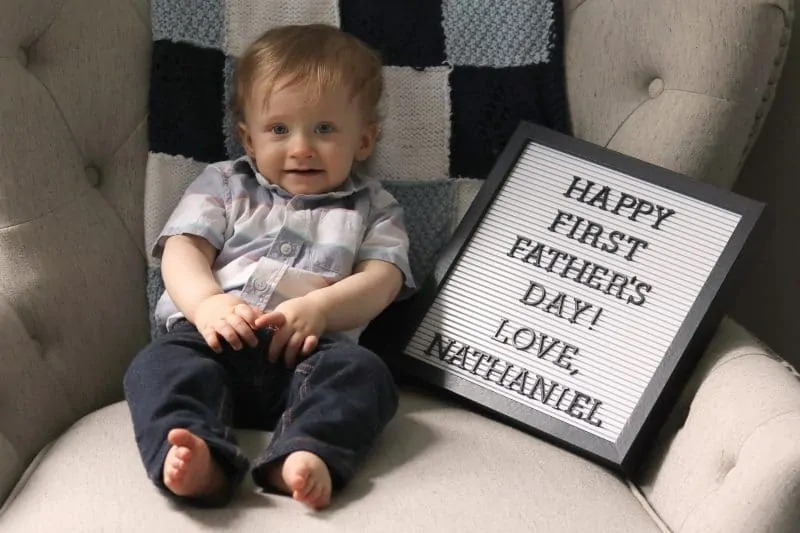 Give Dad a “First Father's Day” photo memento – Take a photo of baby holding a “Happy First Father's Day!” sign to frame and give to Dad on the big day. I bet that he will love to display the picture proudly on his desk at work. We used our letter board to make our sign, but you could just as easily write something on a piece of paper or print something off the computer. 7. Order Dad's favorite take-out – Make dinner special, yet easy, by ordering Dad's favorite take-out. In our house, that means we will be enjoying Chinese food this Father's Day. 8. Make Dad's favorite dessert– Whether it's cupcakes, pie, or pudding, bake Dad's favorite treat for him to enjoy after dinner. 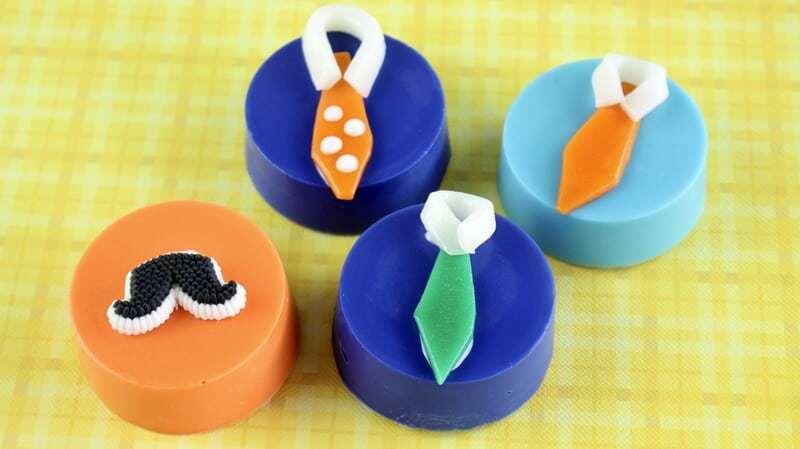 Or for an easy no-bake idea try these adorable mustache and tie chocolate covered cookies. I hope that this list gave you some Father's Day ideas that you can use to help to wish dad a happy first Father's Day. Remember to head over to Amazon to take advantage of up to $3 savings on Huggies, Pull-Ups, and GoodNites, plus 20% off and free delivery through Amazon Family Subscribe & Save. Share with us how you will be celebrating Father's Day in the comments below! What great ways to celebrate. I am always stuck for ideas and find something last minute. Huggies was our go to too.